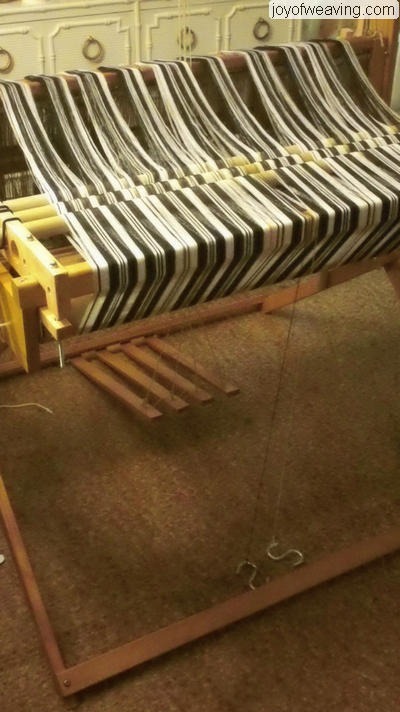 Thanks to a donation by a very good friend, I was able to purchase a wider loom to weave the Scott Family Tartan that was commissioned earlier this year. It's a LeClerc Initation loom. 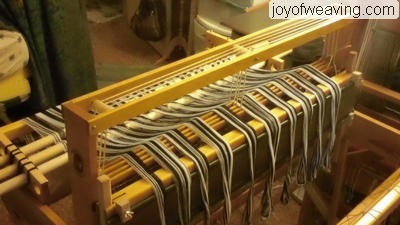 This loom is discontinued but the manuals and parts are all still available online from LeClerc. I bought it sight unseen as it was the first reasonably priced, light weight 4 shaft loom posted to Craigslist in a while. I want to get this tartan done and off my plate so I can quit worrying about it. 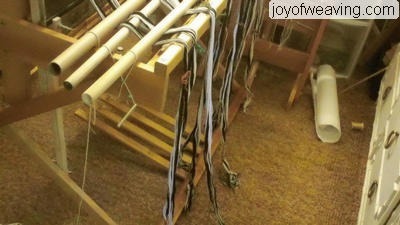 To cut a long story short, we manufactured all the missing pieces to get this loom in working order. I ordered a reed and 1.000 heddles and re-made the warp for the tartan. I tried to save the warp from last time, but the crosses all ended up getting lost. One day I'll find the loop end, put it on a peg and stretch it all out and pull out threads one at a time and re-use it. Now, to boldy go where I have gone before. On to the Scott tartan as part of the dress uniform worn by Montgomery Scott on Star Trek. 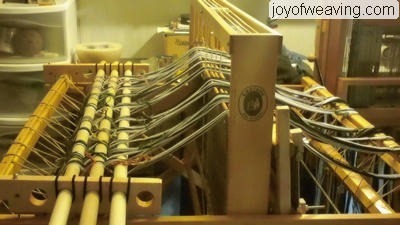 Here's the beginning of the warp going through the tension device on the back of the loom. Nearing the end of the 6.5 yard warp. This is the light at the end of the tunnel. In my hurry to get that last bit beamed, I didn't notice a small tangle develop and ended up with 4 broken threads. Which, all things considering, isn't too bad. I've done a lot worse than this in the past. Finally beamed! Now to take a nice long break before threading the heddles. Being that neither the front nor the back beams come off this loom, I'm not entirely sure how I'm going to achieve this comfortably. This might take me several days to do as there are 1148 ends.